I’m not a wham, bam thank you ma’am kind of decorator. I would much rather do things little by little – waiting for the perfect pieces. Remember the mid century console I found at an estate sale a few years ago. I painted it a fun shade of blue and there it sat. The belle of the ball. Waiting for some equally amazing furniture and accessories to keep it company. 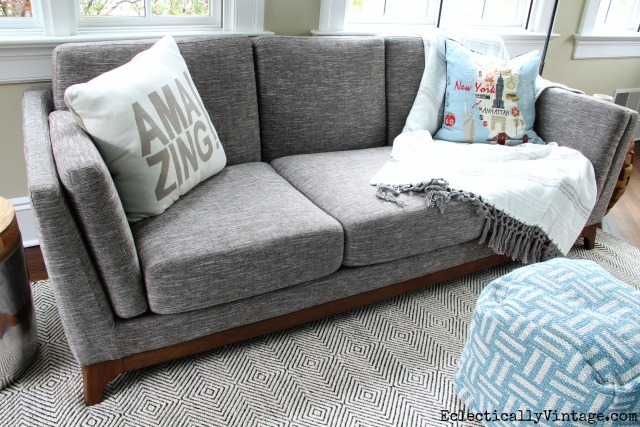 Once my new sofa (don’t miss my tips for buying a sofa online) was in place, my search for the perfect rug began and I found it at my go to rug shop – Rugs USA. 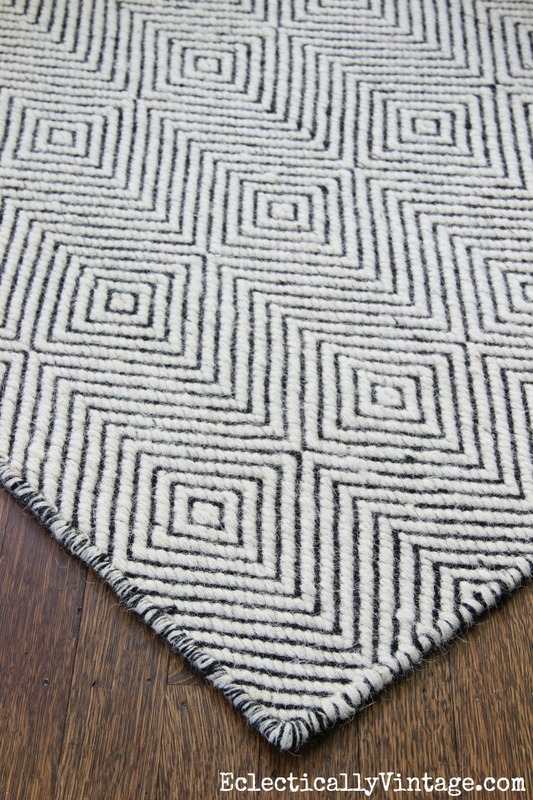 I love the pattern and texture of the Sierra Paddle Rug and prefer using natural materials and love that this is a blend of wool and cotton. The rug and sofa are the supporting characters to the blue console table and vintage map which remain the stars 0f the show. I added in a little more blue with the pouf and pillow – I even painted the ceiling blue! I plan to paint the room white (but keep the blue ceiling). Are you a one stop shopping kind of decorator or slowly over time? Thank you for supporting the brands that make my blog possible – sponsored by Rugs USA. Beautiful room with many wonderful details that you can tell was carefully collected over time….In most circumstances I am a “slow over time” kind of gal. Welcome to the slow club Shirley! Slowly overtime. Your room looks great and colorful. Thanks Marlene – glad you’re in the slowly camp with me! I wish I could be a one stop shopping kinda gal and find all on my list at once to satisfy my less than patient decorating nature, but that never happens! I love your sunroom … always have! Your new treasures in here are the crowning touch (especially your blue ceiling). 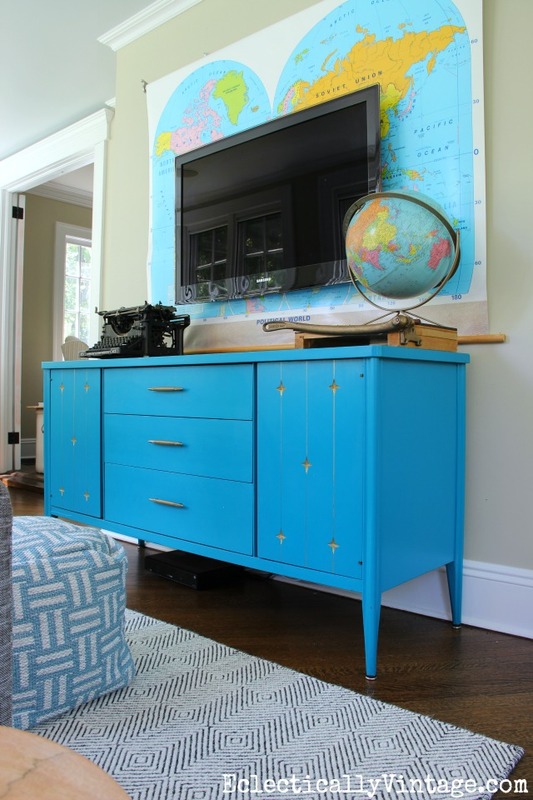 Awesome rug, too … the contrast of your fun blue console table with it is perfect! One stop shopping is boring Becca – enjoy this Dad’s day weekend! 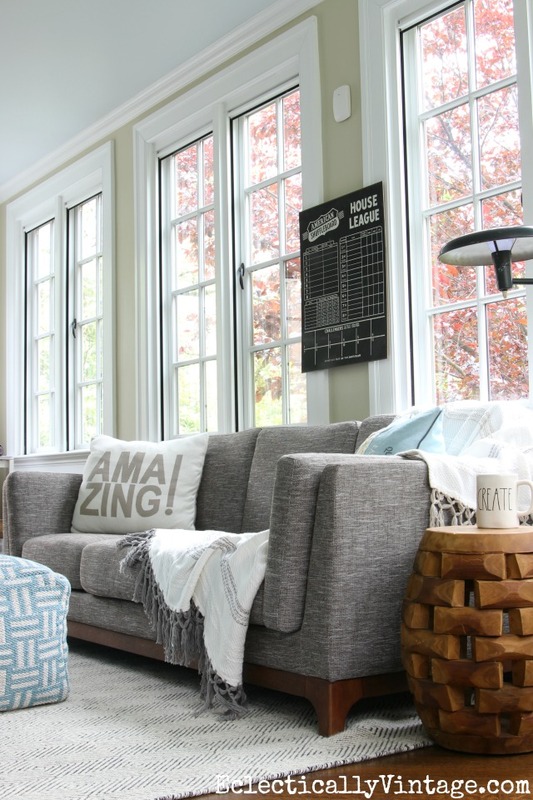 I have missed out a lot on your blog Kelly, but love the changes in your sun room especially that sofa and rug! I ordered the same rug a couple of years ago, but got the wrong color and return was a disaster so I opted not to get it in the end! loved how it looked in your space! Thanks so much Vel – sorry you didn’t get the sofa of your dreams. Have a great weekend with your family!